Who remembers Timmy Turner from the Fairly Odd parents TV show? 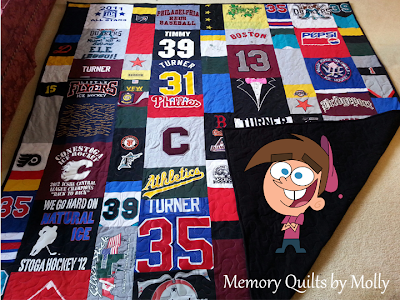 This modern style, full size quilt is going to a graduating senior whose childhood nickname was Timmy Turner. He even had a hockey jersey bearing this name! Of course it was added to his quilt!